When the last Maha Uparaja passed away, HM King Chulalongkorn thought hard about who should be made the new heir to the throne. In the past, the Maha Uparaja would be chosen from one of the king's younger brothers, by the king. The last Maha Uparaja was not chosen by a king, but by a council of royals and statemen during the last days of King Rama IV. The majority thought that by appointing the eldest son of the Second King Pinklao, they were able to let the memory of another great king live on. This time would be different. King Rama V did not in fact see eye-to-eye with the last Maha Uparaja, so he had his cabinet researched the full history of the Maha Uparajas. In short, it has always been the king who appointed the next in-line. So, this time the king chose his own son, and introduced a new title of Crown Prince, or Somdetch Pra Boroma Orasathiraj Sayam Makut Rajkumar, which translates virtually exactly to that the son of the king would be the next in-line to the throne. He would then pick the first-born to him and his principle Queen. As Prince Vajirunhis fell exactly into this category. The decision was made, and the 8-year-old Vajirunhis would get a big party to celebrate. 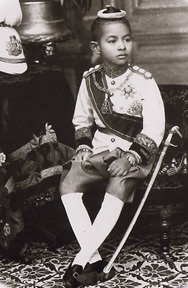 As was evidence in Prince Vajirunhis' diary, he was a very well learned child, brought up to rule, and he was very mature for his age. 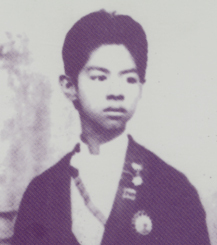 He kept a diary since he was six years old, and was able to write English fluently by 15. This would add to the fact that Royal boys came of age at about 10-11 years of age, when they would go through the Tonsure Ceremony, advertising to all about their grown-up status. 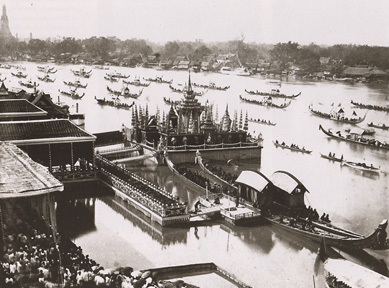 A specially built structure for the "Long Srong" or "Long Tha" Ceremony in preparation for the Investiture of the Crown Prince where the prince would be bathe in the river. The ceremony was performed by King Rama V on 14 January 1886 at Rajvoradis Pier. The Royal Barges came out in full force for the ceremony. Wat Arun, or the Temple of Dawn can be seen top-left of the picture. Friday, 14 January 1886 - The Long Srong Ceremony - "I woke up at 7am, had breakfast, then dressed in white uniform. Started on the palanquin at 9am and the procession went past the rose-apple tree, the Royal Mint, and went through the Srisunthorn Door (of the Grand Palace) and to the Pae Villa. His Majesty received me at the Rajakij Throne Hall. Grandmother watched from the Rajakij Hall. Took my clothes off, and changed into another. Then His Majesty lead me. Uncle Devan (Prince Devan Uthaiwongse) has not arrived. Uncle Toa lead me instead to the raised platform. Received prayer, then was lead to sit at the ceremonial stand to wait for the auspicious time. When the time came, I floated the offerings, coconuts, shrimp, fish. Then His Majesty carried me down the steps, and handed me over to Uncle Noi (Prince Bhanurangsri Savangwongse). Uncle Noi received me from His Majesty's hands. Uncle Noi wore cloth of white and gold, and carried me to swim among the coconuts. Swam three times, and came up to sit on the three-tier stand, where His Majesty poured holy water on me first, then (the members of the holy monks and senior members of the royal family). Then changed into the Krui (a light gown richly embroided in gold) but wore it like a monk. Then went on the palenquin back to the main palace and was given the Supannabatra (a solid gold card inscribed with the name of the royal whom the king is naming, traditionally given to new-born royals. In this case, Prince Vajirunhis received a new name and title as Crown Prince of Siam) and the regalia which included two swords, a Nine-Gems ring, an emerald ring with my crest etched into the emerald. Then I changed into my new Crown Prince uniform, wore the Noparatana Star, wore the Noparatana Necklace (the highest Royal Orders and Decorations), carried a pistol (part of the regalia), and was taken back. I did not go back home, but stayed in the garden. At 4pm I changed into Krueng Ton uniform and wore the Crown of Dangling Flowers, then went back." Saturday, 15 January 1886 - "I woke up at 8am and played with the younger royals. About 2pm got dressed and put on ankle bracelets and went to get dress further at Nong Kran Throne Hall. Uncle Noi came to put on the headdress. Today I wore the five-tier Chada, which is heavier than the Flower Crown. I sat under the Savetra Chatra (white tiered umbrellas reserved for royalties) and was carried in a procession at the Vien Tien Ceremony (a Buddhist ceremony involving the walking around a holy mount three times with lighted candles). His Majesty gave me 20 chang of money (old currency, 1 chang = 80 Bahts) and a Chinese gold bar. The English Ambassador named (Sir E. M.) Satow came with a telegraph from the Queen (Victoria) of England wishing me well. His Majesty told me to shake hands with Ambassador Satow, and asked him to pass on his long words of thanks to the English Queen. The ambassador said that the Queen wishes to know all the details of the Long Srong Ceremony. I came back and went to bed at about 7pm." Tuesday, 18 January 1886 - "At 9am I got dressed in yearabub (brocade made of silk woven with gold threads) and put on the Chula Chom Klao and Chakri necklaces, tied on the bracelets, wore the three sash including the Noparatana, pinned on three stars, Noparatana, Chakri and Chula Chom Klao, the diamond headdress (a hat-like headdress) and wore the ankle bracelets. I went up to His Majesty's room. I wore the Krui, and was taken on the palanquin (carried by soldiers) in a procession around the city. I went with His Majesty to the Sutthaiwawalaya Throne Hall, and he took off his krui and crown, and I followed suit. Other royals including Uncle Noi came and bowed, and received royal decorations. They came from the North and South, and walked up in orders followed by the Mom Chaos, Ministers and the Army. It looked beautiful. When finished distributing the decorations, (the king) gave to Uncle Noi a golden sword, gave a Noparatana Star to Uncle Devan (Prince Devan Uthaiwongse). Many royals received the blue sash (decorations) as well as many ministers, royals from the colony as well as regents of the different regions. It rained at that time, but when we were to move in a procession, the rain stopped. The sun shorn when we moved out. His Majesty threw coins all the way, and placed some at the four trees (a symbolic gesture). All the royals wore yearabub and crowns/coronets, in full regalia. I saw Mother and other female royals came out to watch the ceremony. We came back in the afternoon, and I was a little tired because I had to sit for a long time. There was also a gun salut as well when we were moving. When we finished dinner, Mother went back to her room. I watched the entourage of royals until finished. It was late. To bed at 7pm." Wednesday, 19 January 1886 - "Woke up, had breakfast and played in the reception room. Went to see His Majesty in the afternoon. He told me to go and fetch the Supannabatra for him to look at again. He then gave me a kiss. At night, I went back, had dinner and played on the balcany. Went to bed at 1am." Thursday, 3 February 1886 - "Woke up early and had breakfast. At 10am had a photo session. Today, I wore the Kreung Ton uniform, and took two pictures. In one I wore the crown, and another I wore the five-tier Chada. In another picture I wore the same clothes as when we went around the city. Came back at 1pm. Went with His Majesty to receive the aristocrats. At night, there are a lot of letters for His Majesty. He went up at 8pm. I came back and played in the reception room. Went to bed at 10pm." Sadly, Crown Prince Maha Vajirunhis did not lived beyond 17 years old. The prince died of typhoid on 4 January 1895, just 9 years after this historically important ceremony.